Combinations of anthracycline, taxane and fluoropyrimidine are highly active in advanced breast cancer (ABC). In a phase II study of epirubicin 50 mg/m2, docetaxel 75 mg/m2, and infusional 5-FU 200 mg/m2/day, we found dose-limiting neutropenia and frequent central venous catheter complications. 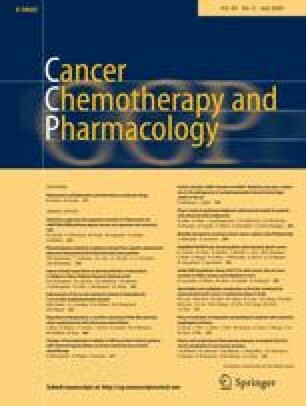 An alternative approach has been tested using weekly fractionation of docetaxel, and oral capecitabine. Four DLTs occurred in six patients at the second dose level (febrile neutropenia in 2). There were frequent dose delays/reductions, and fatigue, nausea/vomiting, and diarrhoea were common. Overall, six of ten assessable patients achieved a partial response. An active regimen, but significant haematological toxicity precluded dose further escalation. The online version of this article (doi: 10.1007/s00280-009-1021-x) contains supplementary material, which is available to authorized users. We would like to thank the research team at St James’s and Cookridge Hospitals for their help with treatment and the majority of the data collection, in particular the data manager Tahira Khan. We acknowledge the ongoing support of Cancer Research UK for salary and infrastructure support of the research team. Financial support for the study was provided by Aventis and F. Hoffmann-La Roche. The above took no part in the collection, analysis and interpretation of data; nor in the decision to submit the manuscript for publication. The protocol was investigator led and initiated, with input from Aventis and F. Hoffmann-La Roche, who also reviewed the manuscript. D. Dodwell and T. Perren have received honoraria for advisory work and speaking engagements from Aventis and F. Hoffmann-La Roche, and S.Waters has received training funded by F. Hoffmann-La Roche.